NASA’s Plan to Save Earth From Yellowstone Supervolcano May Backfire Into End-of-Days - Breaking Israel News | Latest News. Biblical Perspective. In the wake of ongoing seismic disturbances at Yellowstone, NASA scientists have suggested a drastic solution that they admit may actually set off the globally threatening catastrophe they are trying to prevent. One rabbi, steeped in knowledge of the Bible, suggested the scientists take a good look at their methods and try a more spiritual approach. As tens of thousands of people gathered in Yellowstone National Park Monday morning to witness the once-in-a-century solar eclipse, the area was hit by a 3.2 magnitude earthquake. This recent tremor, though not large, is part of an ongoing series of quakes that began June 12. Experts believed the unusually large swarm of earthquakes would gradually die down but by the beginning of August, over 1,400 minor tremors had been recorded at the site. As a result, scientists are investigating how to cool off the seismic hotspot in order to prevent a catastrophic super-eruption. NASA announced this week that it is working on plans to drill six miles down into the volcanically active region and pump water into the magma at high pressures. The water would return to the surface at 662 degrees Fahrenheit, bringing some of the volcano’s heat with it. The project is massive, estimated to cost $3.46 billion, and admittedly risky. But the NASA scientists working on the project are convinced that Yellowstone poses enough of a threat that they are willing to risk setting off an eruption. 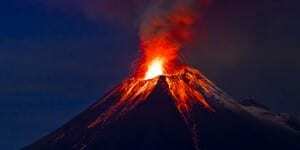 While the scientists tinker with the supervolcano, Rabbi Rami Levy, a well-known kabbalist from Jerusalem, was skeptical of their plan to save the world. The rabbi explained that earthquakes are an inevitable and unavoidable part of the End of Days, quoting the prophet Jeremiah. Rabbi Levy stated that in many cases, science has portrayed itself as the savior while attempting to solve problems it had actually created. In the case of Yellowstone, the rabbi advised the scientists to delve into the prophetic writings of the Bible. The Yellowstone caldera is only one of approximately 20 known supervolcanoes that threaten the Earth. The dangers from a large eruption are far greater than those posed to the immediate vicinity by magma and ash. An eruption at Yellowstone would spew abrasive ash into the atmosphere, covering fifteen states and preventing airplanes from flying over the central United States for several months. The greatest threat from an eruption in the agricultural heartland of America would be from starvation. Prolonged volcanic winter could potentially prohibit the US and other countries from having enough food for the current population. Some scientists insist the chances of a catastrophic eruption at the Yellowstone caldera is extremely unlikely, one in 730,000, but the NASA scientists disagree.